Stocks closed on the 200 day moving average again Tuesday. And the market is looking higher once more, as investors feel the relief of a likely deal to avert another government shutdown. – S&P 500 Tests the 200-Day Moving Average Again. – Home Construction Stocks Show Relative Strength. 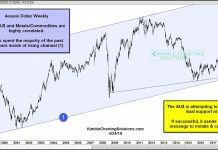 – Chaikin Power Grid for the S&P 500.